Born near Decorah, IA on March 20, 1855, Edith White, at age four, came across the plains with her family in an ox-drawn wagon. Upon arriving in California, they settled in a mining camp in Nevada County. After graduation from Mills College in Oakland in 1874, she studied art at the School of Design in San Francisco under Virgil Williams and later at the ASL in NYC. In 1882 she established her first studio in Los Angeles and after 1892 lived in Pasadena with a studio in the Green Hotel. While there she was a cofounder of the local art association in 1896. As a member of the Theosophical Society, in 1902 she moved south to Point Loma and taught art at the Raja Yoga Academy. By 1930 she had returned to northern California and established a home in Berkeley at 2801 Russell Street. 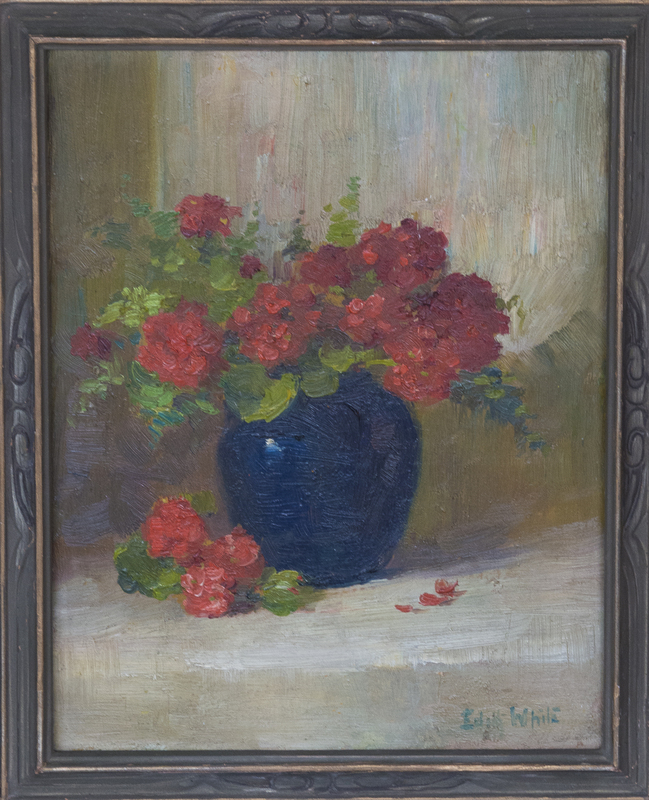 At her studio there she continued to teach and paint into her old age. Unmarried, White died in Berkeley on Jan. 19, 1946. 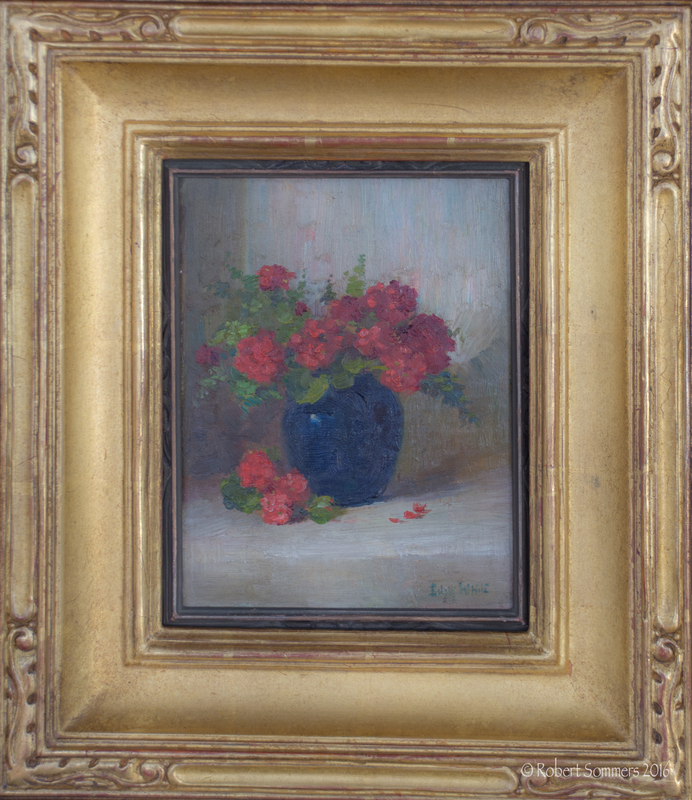 Her oeuvre includes portraits, floral still lifes, missions, and landscapes with flowers. Sanborn & Vail Gallery (LA), 1890; SFAA, 1890, 1896; Byrson Bldg (LA), 1891; Calif. State Fair, 1892-99; Calif. Midwinter Fair (SF), 1893; Chamber of Commerce (LA), 1894; Calif. Midwinter Int’l Expo, 1894; Arcade Sketch Club, 1894-97; Pasadena AA (founder), 1894-97; Pasadena Art Union, 1896; Denver Artists’ Club, 1898; Ruskin Art Club (LA), 1902-04; Shakespeare Club (LA), 1906; Fine Arts League (LA), 1909. San Diego Historical Society; Santa Fe Railway; Mills College (Oakland); Mt Holyoke College; Denver Public Library; CHS. California State Library (Sacramento); Southern California Artists (Nancy Moure); Women Artists of the American West; Artists of the American West (Doris Dawdy); Oakland Tribune, 1-20-1946 (obituary).